Cory Diedrich, Matt Story, and I have been planning this past weekend for over a year, so we weren't about to let a little blizzard stop us. We have been talking about exploring the south unit of the Badlands National Park for over a year since we read a New York Times article about it. We emailed the National Park Service, called adjacent landowners, and studied aerial photos and topographic maps. Information about the area was rare, but we had two possibilities for routes into the Palmer Creek Unit. On Friday, we met in Vivian, SD where we left my pickup and loaded my gear into Matt's pickup and headed towards the main entrance and visitor center of the Badlands National Park. We camped in the main campground the first night, so we could stop at the visitor center on Saturday morning. We gained a little more information by asking questions in-person and face-to-face. 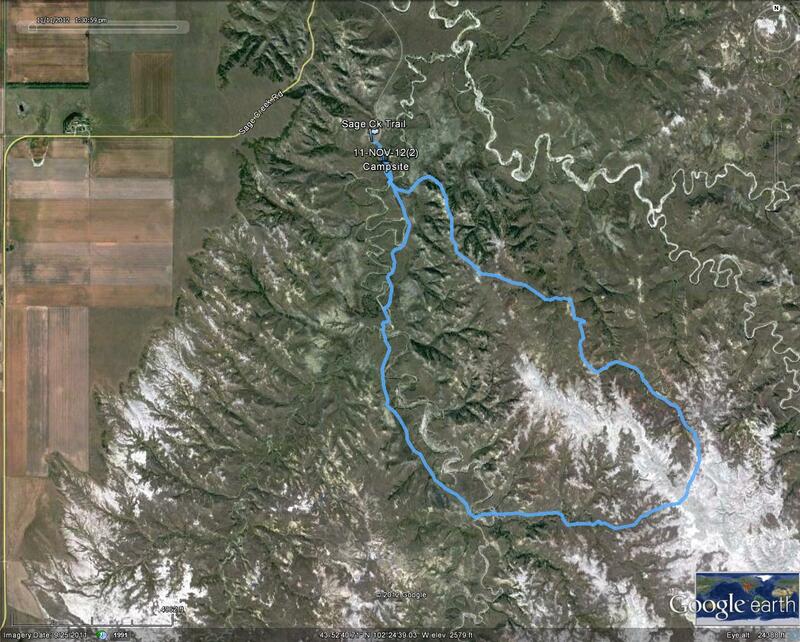 The way we would get in was a dirt road that went east from the White River (South Unit) Visitor Center. We also decided that with the approaching blizzard, we would go down and check it out and return to Sage Creek before it hit. 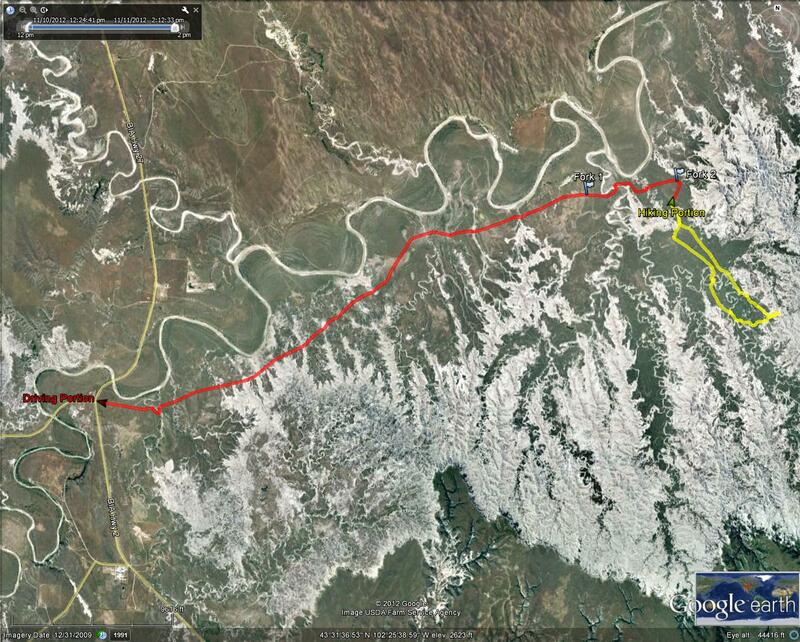 The red line is what we drove (8.0 miles) into the Palmer Creek Unit and the yellow line is what we hiked (4.4 miles). Much of the Badlands South Unit spent time in the 40s and 50s as a aerial gunnery range. Apparently, a high water crossing. We chose to take the low water crossing. The blizzard began to hit as we were hiking in the Palmer Creek Unit. Hiking back to the truck was made difficult by sleet/snow stinging our faces. We probably left a little later than we should have. The road back up to Scenic, SD was getting slick. Just past Scenic, we turned onto a gravel road that wasn't near as bad, but visibility was dropping significantly. Not too long later we arrived at the Sage Creek primitive campground and trail head. The campground was getting hit by the wind pretty hard, so we grabbed our packs and headed into the wilderness area. After about 0.2 miles we found lower ground also protected by trees. We setup camp and had some hot food (freeze dried meals) before diving into our sleeping bags. During the night, the low temperature was -2 degrees and the low windchill was -8 degrees. We all stayed warm enough, but we spent about 14 hours in our sleeping bags before it was light and warm enough to crawl out. We made the decision on Sunday morning to do a little day hiking to warm up and then return to tear camp down and head for home. We could handle the overnight temps, but the time spent in the sleeping bags was unbearably boring. Note the Badlands formations in the background. We are, roughly, heading in the direction of Deer Haven. Our loop on Sunday. About 7.6 miles, including the distance from and to the trail head. We saw much wildlife during our hike on Sunday. Including, numerous bison, coyotes, deer, and antelope. There was one coyote that, afterwards, we debated whether it was a coyote or wolf. It seemed quite large and dark colored for a coyote and we have heard of some wolves reintroducing themselves into South Dakota. We also saw two large bucks; the second being VERY LARGE by all of our accounts. And, he is safe as long as he stays in the Sage Creek area.